At the beginning of March, The Fifth Parlour had the honour of not only sitting in Joss Stone’s press conference in conjunction with Singapore International Jazz Festival (Sing Jazz)Festival, we also had the chance to sit with her for a while together with a few media friends to ask the songstress a few questions about her career and her views on life. From the get-go, we can already sense that there are no “airs” about this lovely lady. She literally strolled into her own press conference with no fanfare. While the host was in the midst of introducing her and trying to rouse the crowd, Stone walked in with her flowy top paired with light wash jeans and sandals, sporting a cheeky grin, placed her sandals at the side, and made herself comfortable on the sofa much to the amusement of the host and the crowd alike. The way Stone spoke about music, everybody in the room can see and feel her passion for it. She loves singing, she loves writing, she loves listening to melodies and much more. When asked what would be her advise for young new artist going into the industry, Stone shared that one must always remember the reason they entered the music industry in the first place, however silly the reason may be. She shared that the main reason she decided to venture into this industry was simply because she wanted to raise money to buy her family a horse! That was what kept her going on. Even until today, she remembers what got her started, how far she has gotten, and where she is headed. Of course, passion for music is also important. 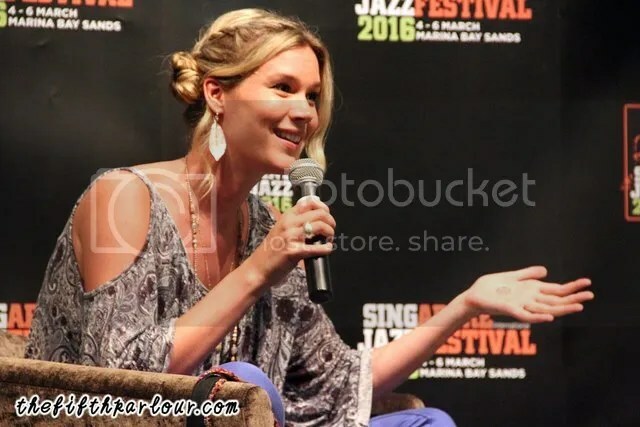 When an audience member asked what was the craziest thing she has ever done in her career, without missing a beat, Joss Stone answered, it was when she gave back to her former record label a whopping $14 million dollars. By giving back the money and getting herself out of the deal, Stone recalled how liberating it was to be free and on her own. Although it was a risky move, she believed it was one of the best things she has ever done for her own career and sanity. Now, she calls the shot and she is perfectly happy with it. It then led to the next discussion. Stone talked about her music and her latest album, Water For Your Soul (2015) citing the many influences that are incorporated into that record and how it was aimed to appeal to a wider audience. The reason she is able to do such an album is due to the fact that she is an independent artist. Besides raggae, Water For Your Soul consist of so many different influences including Arabic, Indian and Spanish instruments. We can see that so much passion and zest for life is contained in that slender body of hers. She mentioned that it was important not to judge people, keep our eyes and ears open to absorb all the different colours of the world. A very recent example, she had no idea that Singapore is a multi-cultural country. This trip, she made it a point to link up with a Chinese opera theater company to learn a thing or two about the opera and how it weaves into the Singapore culture. Although her music is not predominantly jazz, being invited to SingJazz Festival and other Jazz festivals around the world has shown that her music appeals to a vast number of people, including young and old. Her passion for music coupled with her love of life, Stone exudes calmness, positivity, power and tenacity which are all important to last in this volatile music industry. The Fifth Parlour would like to thank Singapore International Jazz Festival (Sing Jazz) for the invitation!